The launch of the 2017 Modenas V15 at RM5,989 is not a new segment for Modenas, a role having previously been filled by the Jaguh. 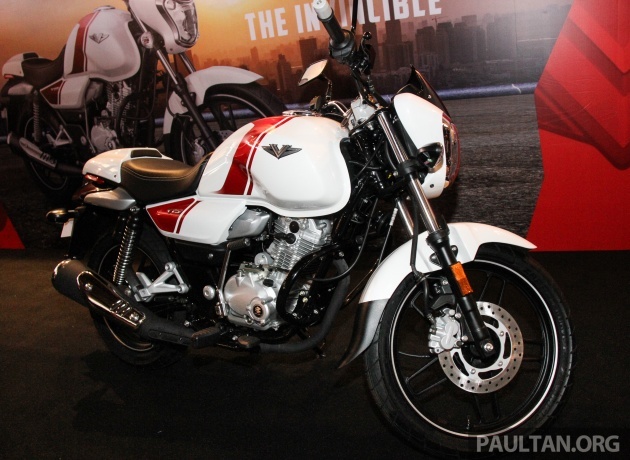 In this case, the V15 is the third of Modenas’ new full-size motorcycle trio in collaboration with Bajaj Auto of India, a classically-styled cruiser. Carrying a 149.5 cc, twin-sprk air-cooled single-cylinder DTS-i power plant, the Modenas V15 puts out a claimed 12 PS at 7,500 rpm and 13 Nm of torque at 5,500 rpm. With a kerb weight of 136 kg, the V15 is designed for the urban commuter market, a role it performs in India and 75 other countries around the world. Braking is with a 240 mm brake disc in front and a 130 mm disc at the rear, and fuel is carried in a 13-litre tank. Features on the Modenas V15 are LED tail lights and a single-seat cowl that is easily removable. The Modenas V15 comes in White/Red and Black/Red, and is available from selected authorised Modenas dealers in the Klang Valley, with roll-out nationwide within the week. Assembly for the V15, as well as the Modenas Pulsar NS200 and RS200, is at Modenas’ assembly plant in Gurun, Kedah. This street bike is cheaper than top range kapchai. Yamaha FZ 150 can close shop too. Others are perfect for a cheapo retro BUT not the headlight. Please change to a simpler round shape one. Everyone will proud to own one. Local R&D TTR200 scraped, not ugly celup fr bajaj. Malu Modenas. Tak dak maruah. Bangang modenas buntu xtaw buat motor sendiri.. Dh la xder power 12hp.. Jer.. Buang duit jer beli..
Is this bike only for single seater? Cannot fetch passenger?